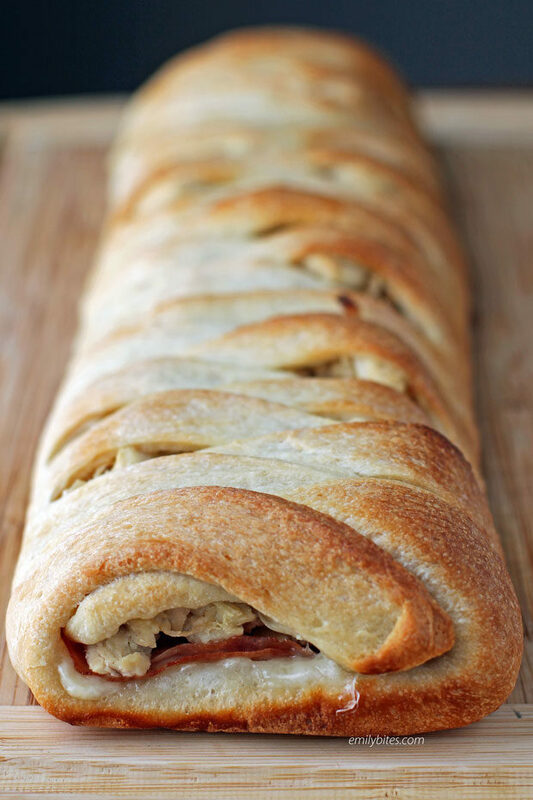 This Chicken Cordon Bleu Braid is an easy weeknight comfort food meal your whole family will love! 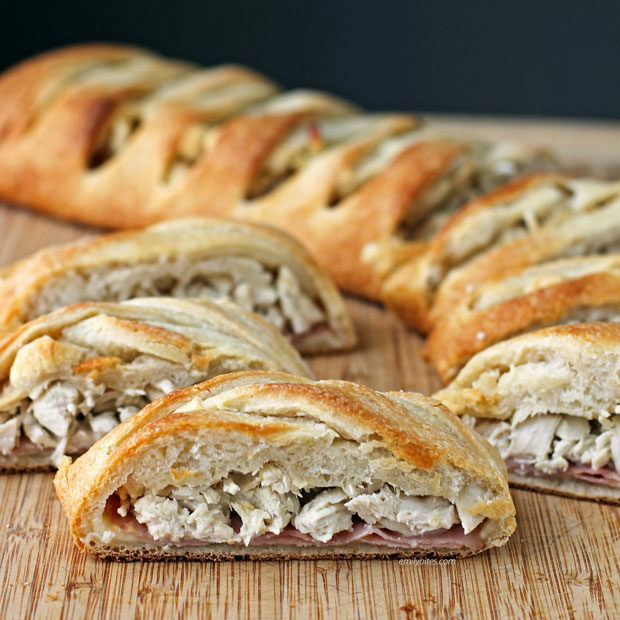 Hearty chicken breast and sliced ham with creamy, melty Swiss cheese and a hint of Dijon flavor, all wrapped up in a crusty dough braid – what’s not to like? I often make up a batch of chopped or shredded chicken breast for the week to use in recipes, on salads, etc, and I especially love making it in my slow cooker so that it’s hands-off and just needs to be shredded or chopped at dinner time. You could also bake your chicken, make it in a pressure cooker, or just remove the skin from store-bought rotisserie chicken breasts. Once you have cooked chicken, the rest of this recipe comes together quickly and easily! 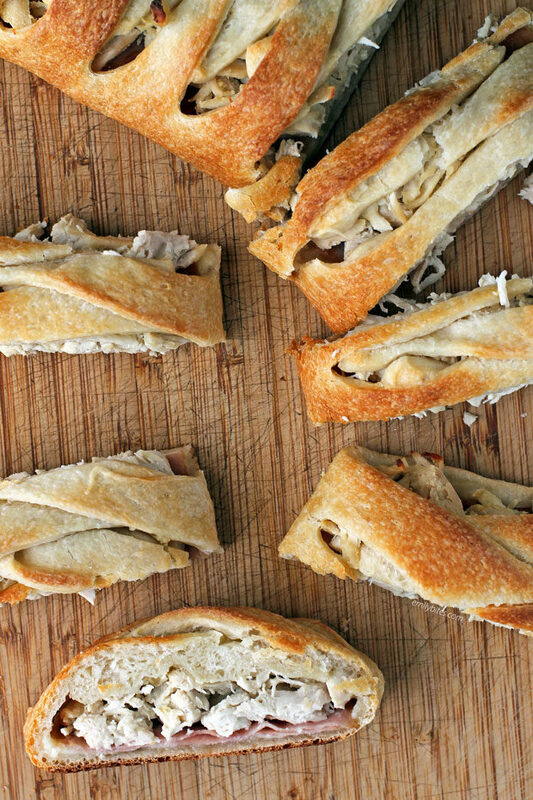 Not only is this recipe fun and easy to make, but two slices of this tasty Chicken Cordon Bleu Braid are just 343 calories or 8 WW Freestyle SmartPoints! I like to serve this as a main course with a side salad or roasted vegetables (like my Garlic Roasted Green Beans with Almonds) for dinner, but the leftovers also make a great sandwich-alternative for lunch the next day! Pack a slice with some fruit and yogurt for a delicious lunch you’ll look forward to all morning. Looking for more easy and flavorful lightened-up meals using chicken? Check out my Bubble Up Cheesy Chicken and Broccoli Bake, Chicken Pot Pasta, Pimento Cheese Stuffed Chicken, One-Pot Spicy Dirty Rice with Chicken and Sausage, Tuscan Olive Chicken, Creamy Chicken and Gnocchi Soup, Chicken Teriyaki Stir Fry, Cheesy Buffalo Chicken Chickpea Bake, Buffalo Chicken Braid, Crispy Cheddar Chicken with Cream Sauce, Barbecue Bacon Wrapped Chicken Tenders, Bubble Up BBQ Chicken and Beans Bake, White Chicken Chili, Fiesta Stuffed Chicken, Baked Chicken Tenders, Cheesy Buffalo Chicken Potato Bake, Cream Cheese Stuffed Everything Chicken, Bubble Up Chicken Pot Pie Casserole, Cheesy Bacon BBQ Chicken, and so many more in the Chicken section of my recipe index! Place the chopped cheese wedges in a microwaveable mixing bowl and microwave on high for 1 ½ minutes to soften. Add the mustard and shredded/chopped chicken and stir/mash together with a fork until the cheese and mustard coat the chicken. Set aside. Unroll the pizza dough onto a piece of parchment paper on top of a cutting board and roll the dough to be 10”x14.” Using a pizza cutter or a sharp knife, make cuts up one of the longer sides of the dough, about 1 inch apart and about 3 inches long (into the center). Mirror those cuts on the opposite long side of the dough. Place the Swiss cheese slices down the center of the pizza dough, in a row with the cuts on either side. Add the ham slices on top of the cheese slices. Spread the chicken mixture down the center, on top of the ham. Starting at one end, fold a strip of the sliced dough on the side diagonally over the center ingredients. Fold the strip across from it over that strip in a criss-cross and repeat, alternating sides, until the strips of dough are covering the center in a braided pattern. Brush the top of the braid with the melted butter. Transfer the parchment paper with the braid onto a baking sheet and bake in the oven for 20-25 minutes until the dough is golden. Slice into 12 equal pieces and serve (a serving is 2 pieces).